When the British government implemented the Tea Act of 1773, it greatly upset the American colonists. The Tea Act gave the East India Company the right to sell tea directly to America without an export tax, but it put an import tax on tea that was purchased by Americans. Essentially, this act was designed to allow the East India Company to make a higher profit in order to get out of the financial trouble it was in, and to monopolize the tea trade. However, it still forced Americans to pay tax at a profit to the British government. Americans opposed this tax because they felt they were already being taxed unfairly without being represented in the British government. When word spread that shipments of tea were to arrive in the ports of Boston, New York, Philadelphia, and Charleston, Americans called for the consignees, or the people who accepted the delivery of the tea in port, to resign. All did, except for those working in Boston. The Americans' retaliation became known as the Boston Tea Party. On November 27, 1773, three ships loaded with tea arrived in Boston harbor. They were prevented from unloading and told by the Americans that they should leave the harbor. On the night of the December 16, 1773, a group of men known as the Sons of Liberty disguised themselves as Mohawk Indians and boarded the ships. They began to open the crates and dump the tea into the harbor. Crowds of people watched in silence. Fearing they would be caught, the Sons of Liberty worked at quickly as possible. When they were finished, a total of 342 crates of tea were emptied into the harbor. 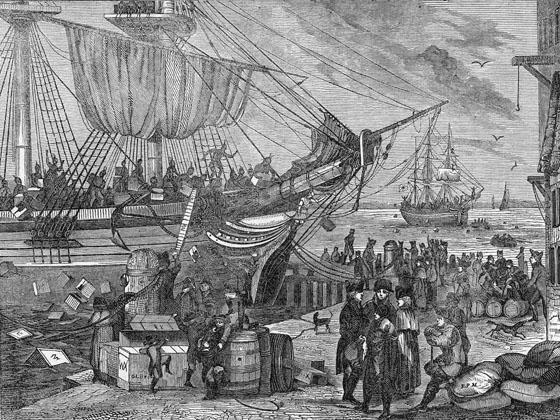 The image depicts men dressed as Indians throwing crates of tea overboard, with several people watching from the dock. George Loring Brown (1814-1889) was an artist from Boston who worked in New York City and Europe. He probably painted or lithographed the image that this engraving was based on. Destruction of Tea in Boston Harbor in 1773 was probably engraved by Richard P. Mallory, who was a wood engraver and artist in Boston from the 1830s to the 1860s. 1. Groce, George C. and David H. Wallace, The New-York Historical Society's Dictionary of Artists in America, 1564-1860 (New Haven: Yale University Press, 1957) 85. Dimensions: 14.4 x 19.4 cm.